Respawn Entertainment has officially unveiled the first Battle Pass for battle royale shooter, Apex Legends. The first competitive season, called Wild Frontier, will start tomorrow, March 19 at 10 am Pacific/1 pm Eastern. If you’re familiar with Fortnite, Apex Legends’ Battle Pass is largely the same. You can purchase a Battle Pass in game for 950 Apex Coins, which translates to about $10 of real money. The Battle Pass includes 100 cosmetic items that you can then earn through regular play by gaining experience and leveling up. Note that you’ll work towards unlocking the battle pass goodies whether you purchase the pass or not, but you’ll obviously need to purchase it to gain the rewards. If you purchase the Battle Pass later during the season, your progress will carry over and you’ll earn all the applicable rewards. Unlockable rewards include weapon skins, character skins, banners, badges, epic and legendary loot boxes, and 1,000 in Apex Coins. The last unlock in the Battle Pass is also the first evolving Legendary weapon skin for the Havoc, which has three stages. The Season 1 Battle Pass is purposefully designed to feature all Legends and provide a variety of unlocks for newcomers. “In terms of rewards, we’ve tried to create a Battle Pass where first-time spenders can get a strong base of weapon and character cosmetics to fill out their initial collection at a deep discount,” writes Lee Horn, Lead Product Manger, Respawn Entertainment. 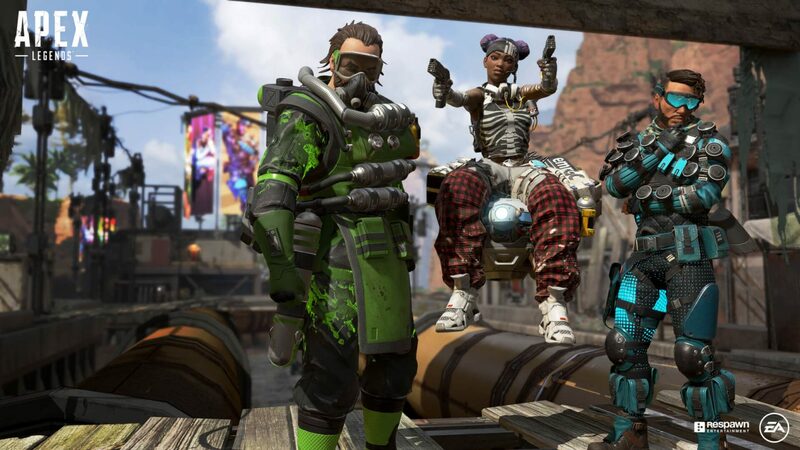 If you’ve got the cash and want to skip ahead, Apex Legends is offering a Battle Pass Bundle. The Battle Pass Bundle costs 2,800 Apex Coins and grants the Battle Pass as well as instantly unlocking 25 levels of rewards. Everyone who plays during Season 1, which will last about three months, can earn one Wild Frontier Legend skin, five Apex Packs, and 18 Wild Frontier Stat Trackers. Purchasing the Battle Pass will grant access to three new Wild Frontier skins for Lifeline, Wraith, and Mirage. Also arriving in Season 1 is the first post-launch Legend, Octane. Look for Octane’s official reveal soon. Respawn has stated that every season of Apex Legends will add a new Legend. Battle Pass rewards are exclusive to that season. Once earned you keep them forever, but they can never be earned again. Apex Legends is available on PC (Origin), PlayStation 4, and Xbox One. It’s rated T for Teen. The big surprise is that anyone who completes 13 overtime challenges by Feb. 27 will receive season eight’s battle pass for free. The seasonal battle passes normally cost about $10 in V-Bucks. More overtime challenges will become available on Saturday, Tuesday, and next Friday. As further incentive, Epic Games is hosting two double XP weekends. Earn twice the XP when playing between Feb. 15-17 and again during the weekend of Feb. 22-24. Fortnite is in the midst of the Share the Love event for February. Players can still earn a Culled Hearts Wrap skin by supporting a creator through the Support-A-Creator program, until Feb 22. It’s essentially an affiliate program. When earning or purchasing V-Bucks, your chosen creator will receive a share. To support a creator, enter their Epic game tag in the creator section of the item shop. Fortnite is available for free on PC (Epic Games store), PlayStation 4, Xbox One, and mobile devices. It’s rated T for Teen.